Smart PDF Converter Pro is a tool to convert PDF document. It supports many formats and offers different features that are detailed below. 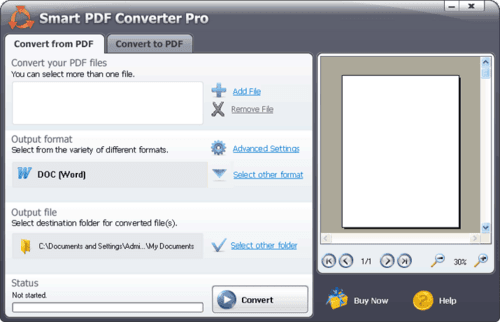 Supported formats: Smart PDF Converter Pro can convert PDF files to other formats. Documents can be DOC, RTF, HTML, TXT, JPEG, TIFF and XLS file formats. Getting started: once Smart PDF Converter Pro is launched, users simply add the document to convert, and then choose the format and destination folder. One simple click of the mouse is enough to convert process. Batch mode: Smart PDF Converter Pro provides a time saving to the user thanks to its batch mode. This method enables the user to convert several documents simultaneously. Easy to use: this tool is lightweight, thus it consumes little memory resources and does not slow down the PC. It is also convenient since it is able to maintain the quality of the original documents after the conversion. Latest update on July 26, 2018 at 05:26 PM.